Fritz's Polka Band breaks the stereotype regarding "polka" music.especially with this recording, as there's only two polkas on the entire CD. 2007 was another busy year for FPB. As he did for the last few months of 2006, George drummed some more gigs for FPB, due to Rick's work schedule. Once again, FPB made history by becoming the first polka band to perform at the famous Metropolitan Club in New York City on September 15, 2007! On December 30, 2007, Fritz's Polka Band was honored to at the United States Military Academy at West Point, NY. This was a Christmas gift for a friend who's Swiss and remembers dancing to Swiss polka music in his younger years - he loved the CD. Edward Burke, College DJ and (admittedly), a polka fan. Do you want to travel? Like music? Have you ever been to Switzerland? No? This is your ticket, then, to a fine, audible cultural feast. 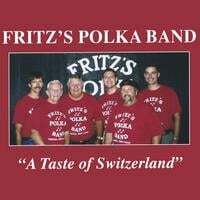 On "A Taste of Switzerland", Fritz's Polka Band gets your toes tapping and your ears a-workin' as they play tradtional and orginal dance music from and inspired by Switzerland, and guess what? Only two tracks are actual polkas. Fritz and his Father Fred both play types of accordions brom both Switzerland and the states, as well as traditional Swiss percussion to creat and authentic sound. The backing band is top notch as well. Yodeling is included, of course, sometimes four-part yodeling if you can believe it! This is a fun album and it teaches you something to. If there were more albums like this, then the world would be much less ignorant of all the great musical traditions that exist out there....luckily there are if you know where to look! I deffinatly reccomend this fine album, perhaps for some good driving music, or drinking music. (Not both at once, I hope)! All tracks are awesome, and should serve to change your preconcieved notions of what polka music is. CD was received, listened to and bragged about. This CD is one of the best "Swiss style", polka music that I have purchased. My family is Swiss and we all enjoy this fine music. I have an Aunt who is in her 80's. When she hears this music she starts looking for a dance partner! I have bought several polka cd's from amazon.com, but this is by far the best dance cd of them all. My Aunt thought that FRITZ'S POLKA BAND was from Switzerland. I told her no, but from Verona, N.Y. Thanks for the wonderful music. Richard A. Egger.